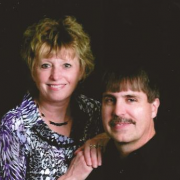 Terry and I were born and raised in Jasper, Indiana and were married in 1980. We have been blessed with one son, daughter in-law and a grandson. God called me into the ministry in September of 2007. In 2012 I was appointed Associate Pastor at Victory Temple Church of Jasper. On March 1, 2013 I started Pastoring Living Waters Assembly of God in French Lick. We love the French Lick area and we reside in West Baden. We are thankful to God for all he is doing, and going to do in the future in French Lick and the surrounding counties!